During my free time outside of HDS, I like to walk around the neighborhood, play on my iPad, go out with my family and friends, and watch movies. I have other hobbies, but these are my main ones. My first hobby that I want to talk about is walking around the neighborhood. I like to do that because it lets me get some exercise, fresh air, and it is fun. I also walk in the park because it is right next to it. Second, I like to play on my iPad. I play on it because it keeps me entertained by usually playing Roblox, going on social media, and I watch videos on YouTube. When the battery on my iPad is low, I go on my iPhone. Third, I also go out with my family and friends. The reasons why I do so is because I enjoy it very much by going to places such as the park, the movies, and out to dinner. Sometimes we go out on road trips. Finally, my last main hobby is watching movies. Usually I watch them in my room, going out to the movie theaters with my family and friends, and I enjoy them so much. And these are all of my main hobbies. Today, I went to visit the Cypress Bay BRIDGES Program to talk about what my experience is like in college at UNF and FIU. I first initiated the speech by telling everyone my name, how old I was, and that I was an alumnus of Cypress Bay High School. I announced to the students about my experience of being a student at Cypress Bay High School. I started off by telling them that I was in the same class as them and that I went through the same experiences that they are going through right now. I expressed to them that when I was in the class, I loved the field trips that we went on, and that I especially loved the dress up week. I then informed the students that I was in Drama Buddies, which is where the Best Buddies Students get paired up with one of the Drama students and they participate in a sort of talent show at the end. Finally, I talked about my experience being in the Cypress Bay Chorus and being able to perform at the Epcot Candlelight Processional, where we go to sing at a show that they do during the holiday season at Disney, and doing the Valentine’s Day Grams, where we get to go around the school singing one love song. I then mentioned to the students about my experience getting ready for College. I notified them that I had taken the ACT and that I had lots of tutors to help me prepare for the ACT. I then reported that after the ACT, I had gotten accepted to UNF. I proceeded to speak about my summer after I graduated, I first went to New York to sing with the Cypress Bay Chorus at Carnegie Hall, but then after that I attended UNF and did summer classes, as well as being associated with the THRIVE Program. I communicated to them that THRIVE is a program run out of the Disability Resource Center and is centered towards college students with learning disabilities, such as ADD, ADHD, and Autism. I conveyed to the students the resources that UNF has to offer and told them that I lived on campus. were saying good-bye to me. I informed them that at Panther Camp, you do activities that kind of associate and give you background about FIU, like some activities share information about clubs and what you can do to get out and socialize and one activity shared information about the resources that FIU has to offer. I explained to the students what my dorm looked like and showed them pictures of my dorm. I then spoke to the students about the resources that they have to offer at FIU and the resources that I use outside of FIU, like tutoring and Peer Group. I ended my conversation by leaving them with these words, “My advice to those seniors going to college is, Be Your Own Advocate. Go out and join a club or go to a sporting event.” I explained to them that at first, I was hesitant about going to the events, but as soon as I went out, I had so much fun. After I finished speaking to them, they asked some very good questions. I showed them my One Card and told them the many things you can do with it, like buying food if you are on the meal plan, getting into the library, getting into events such as football or baseball games, and getting into your room. Overall, it was the most fun experience that I ever experienced. Hopefully, when these seniors and juniors go to college, they will remember that I told them that when they get to college, to go out to events, join clubs, and to meet new people. March 8th, 2019 marks International Women’s Day. Started over 100 years ago, the first gathering on record was in 1911. This is an international celebration, acknowledged by various countries across the globe. “Women are key members of our workforce and community. At HDS, we continue to find opportunities for women through mentoring and leadership. Our vision and diverse skill sets create stronger foundations and platforms for emerging possibilities,” says International woman, Cristina Miranda Gilson, owner and founder of HDS Companies and President and CEO of the HDS Foundation (A 501(c) 3). HDS Companies is a proud to announce that for the 15th consecutive year, we have received the Woman & Minority Business Certification from the state of Florida. Additionally, HDS is also certified by the Women’s Business Enterprise National Council as a National Women’s Business Enterprise. We are an ethnic-racial diverse organization that continuously promotes a positive employee culture. HDS is pleased to have a ratio of 60% female and 40% males employed by the company. To learn more about The HDS Companies, visit our corporate website www.hdscompanies.com where you can select each of the HDS units: Housing and Development Software www.HDSoftware.com,  eHousingPlus  www.ehousingPlus.com, and The HDS Foundation www.hdsfoundation.org. For additional information contact Zainab Hageldain at 954-217-9597 x 260 or at Zainab.Hageldain@HDSoftware.com. On March 7th the BRIDGES program and other ESE students from Cypress Bay High School took a field trip to Florida International University (FIU). 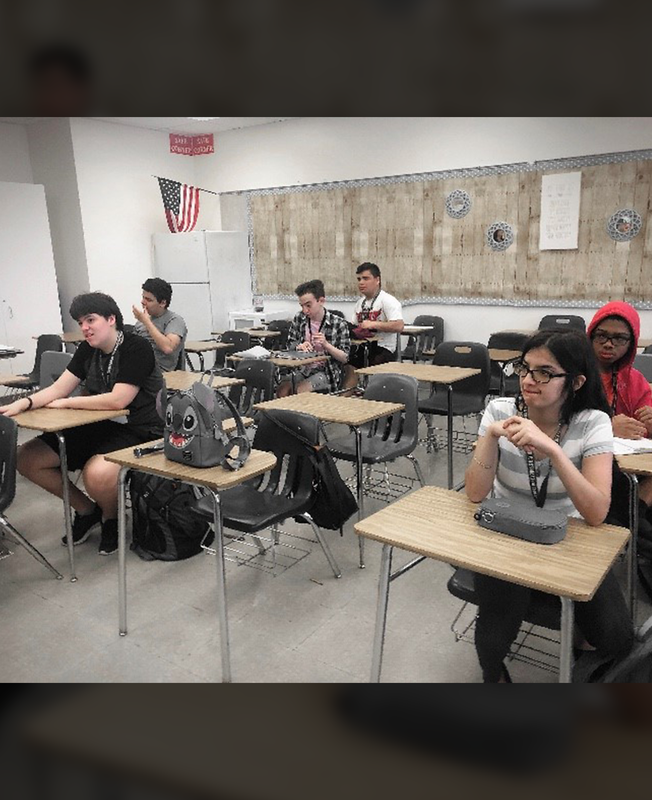 The purpose of the field trip was to provide the students with information about higher education and other programs that are available to students with differing needs. Many students are not aware that they do not need to travel far to get a college experience or a college degree. Upon our arrival, there were FIU staff members ready to give everyone a tour and information. The group was escorted to the Student Academic Success Center where the One-Stop is located. The first presenter was Mayte Capo, the Program Manager for FIU Embrace – Plus and FIU Embrace – Life programs, both are programs offered under FIU Embrace. She provided the students with information about these two programs and services that are provided with them. FIU Embrace – Plus is a Post-Secondary Transition program that is for individuals with Developmental Disabilities (DD). To qualify for these programs, you must have an Intellectual Disability (ID) and be a non-degree seeking student. Someone with Autism may be eligible for the program if they have an Intellectual Disability; however, the department assesses every student and ensures that the student is a fit. The programs provide students with social mentors on and off campus and also provides students with tutors and guidance. Carla Otiniano, Program Manager of the HDS Foundation, asked if a degree seeking FIU student could transfer into the FIU Embrace program. The answer was only if the student is failing in their academics and are overwhelmed, they would be able to transfer. If a student is succeeding academically, they would not be accepted into the program. She also asked if degree-seeking students can partake in any of the services provided in these programs? The answer was that they do not have the resources or staff to do so. Currently they are able to serve 40 students, which is a small percentage of the student population of FIU. Mayte explained that FIU Embrace is looking into collaborating with other entities to expand the program but at the moment it is not available to other students. Additional services provided to students are FIU Embrace – Medical and FIU Embrace – Law. FIU Embrace – Medical is a service available to anyone in the community. They aid adults with autism spectrum disorder (ASD), Intellectual Disabilities (ID), and other neurodevelopmental disorders (OND). Services provided are medical doctors, women’s health doctors, behavioral health, and psychiatry. FIU Embrace – Law is also open to the community, and they help families with Wills, Trusts, and Guardianships. Many of the visiting Cypress Bay students took the opportunity to ask questions. They were definitely engaged and interested. After Mayte finish her presentation, the group was given a tour by Carolina, an FIU Embrace student. She walked us over to the Park view where she lived and gave a tour of her room. That was the highlight of the trip for many of these students. Some of the questions that the BRIDGES students asked Carolina were does she have a roommate, if she shared the common area, and what time does she wake up? After the tour of the dorm room, there was another presentation about the Disability Resource Center (DRC) and their services for degree-seeking students. 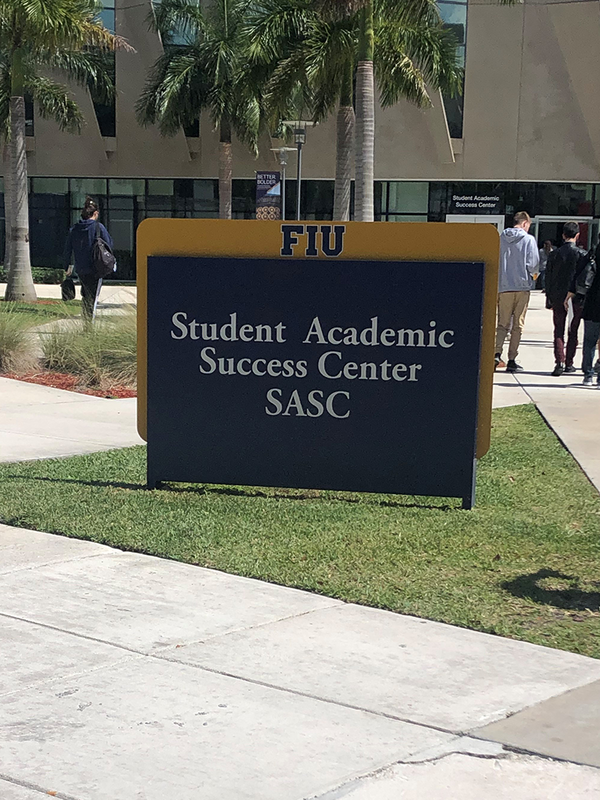 Julie Alexander explained that they are the primary resource at FIU for students with needs for accommodation such as exams, coursework, housing, and information about the campus. She also explained the benefits of students enrolling with the DRC. Students can learn new ways to handle their academic work. She said that the student doesn’t need to suffer in silence as they can help build those educational gaps. When asked if a student is working with a DRC staff member and the student felt it was not a good fit, what can they do, Julie stated that the student could request to change staff members. She also mentioned it is very common for that to happen and the DRC role is to help the student be successful and find the best fit. After the presentation, the group went to eat in the Panther dining area. The students sat around and discussed their experiences. Overall, everyone had a great time and gained much information. This trip was very beneficial to the BRIDGES program. As this program is to prepare them for the transition after high school, this trip to a University puts the lessons learned in the classroom into perspective. If you would like more information on the HDS Foundation, the BRIDGES Program, or how you can help, visit us online at www.HDSFoundation.org or email info@hdsfoundation.org. February was a fun-filled month for the BRIDGES Program at Cypress Bay High School. To start off the month, on February 6th the class went to A Painting Fiesta. At this art studio, students are provided the supplies necessary to create a painting with direction given from an artist instructor. Students did a great job following the directions of the instructor, each creating their own serene sailboat painting. Once finished painting, while waiting for the paint to dry, students socialized and ate their lunches. On February 26th the class visited Weston City Hall and the Emergency Operations Center. Students learned about the people who work for their hometown and the various departments that manage activities around Weston including Parks and Recreation, concerts, parades and 5K Runs. The students were very interested in the different jobs available and asked questions about Weston’s programs and job opportunities. Next the class visited the Emergency Operations Center. This was a special experience as this center is not open to the public. Students continued their engagement in conversations, this time with the Director of Communications. If you would like more information on the HDS Foundation, the BRIDGES program, and how you can get involved, visit us online at www.HDSFoundation.org or e-mail info@hdsfoundation.org.